The 2011 Agriculture, Livestock, Technology and Machinery Exhibition together with the Mannar Investor Forum and Financial Facilitator Forum, which is the first ever mega event of this nature to be held in this region, has grossed more than Rs 10 million in its' on the spot sales alone. During its two days' duration, over 3,000 visitors thronged the show while strong participation from Colombo's private sector was seen in its Investor Forum and the Financial Services Facilitator forum. The mega show was inaugurated by Minister of Industry and Commerce of Sri Lanka Rishad Bathiudeen at Murunkan MV, Murunkan. The event is jointly hosted by the Small and Medium Enterprise Developers (SMED) of the Federation of Chambers of Commerce and Industry of Sri Lanka (FCCISL) and Mannar District Chamber of Commerce and Agriculture. The exhibition which is organised in collaboration with Ministry of Industry and Commerce, District Secretariat- Mannar, Northern Provincial Department of Agriculture - Mannar, Northern Provincial Department of Animal Production and Health- Mannar is supported by the European Union. FCCISL's estimates at the end of the two day event revealed that more than Rs 10m sales have been successfully concluded. Among the on the spot sales contributing to this revenue were five tractors (agro sector), plants and seeds, sales of rice mills, de-husking and processing machine set ups (three), and many agro sector water pumping machine units. These completed sales values do not include additional or confirmed orders for purchases and other inquiries to be processed in the coming days. As for agro and industrial machinery alone, more than 1,000 inquiries have been lodged. 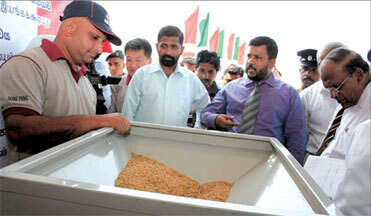 DIMO, the sponsors for the event, also revealed that very high interest was seen for paddy harvesting machinery. In comparison, inquiries for fertilisers and pesticides appeared to be lesser. Hayleys, Browns, Dave Tractors (distributors in Sri Lanka for John Deer tractors) and Red Rose Garments are among the successful sellers at the event reporting profitable participation. Some of these firms also were playing a top role in the Investor's Forum. "As potential investors, we are happy of the outcome" a private sector representative said in the immediate aftermath of the Investor's Forum. The highest private sector interest for investments were for tourism, fishing and palmyra product development sectors. Among the active banks in the Financial Services Facilitator Forum were Sampath Bank, People's Bank, Bank of Ceylon, and HNB. Among the agro insurance aspects that were in high demand was crop insurance. HNB Assurance appeared attracting many prospective farmer clients from the region. Minister Bathiudeen, inaugurating the mega show, said: "A first ever mega event of this nature held for the region, it bestows me and my people with great honour". Mannar region voters also represented by Minister Bathiudeen as he was re-elected as a Member of Parliament in April 2010 from the Vanni, comprising Vavuniya, Mannar and Mulaitivu Administrative Districts. Speaking on the background to the event, he said "The story of this mega event goes as far back as 2009 when Oxfam GB was contracted by the European Union as an implementer of the project "Socio-Economic Development for Conflict Affected Communities of North and East Sri Lanka". The project was to improve access to infrastructure and enhanced capacity to significantly improve household income and food security of conflict affected families. The committed Federation of Chambers of Commerce and Industry of Sri Lanka is the key national private sector implementing partner of Oxfam. The Mannar has been a very backward region due to the three decades of terrorism and now, in the aftermath of the peace in Sri Lanka due to the leadership of President Mahinda Rajapaksa. Mannar region has begun to develop at a rapid pace.